Limited to just 38 sets, the F.P. 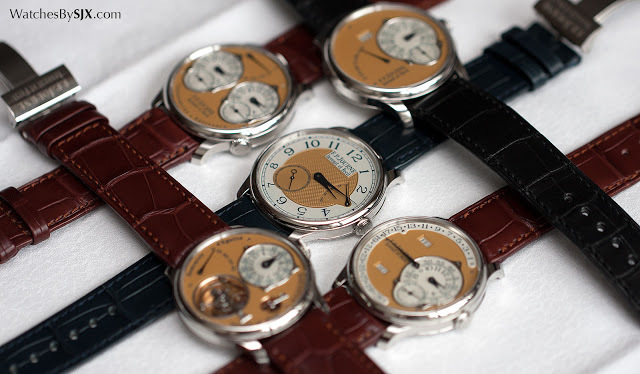 Journe Steel 38 mm Set comprises the brand's most important wristwatches with steel cases in the discontinued 38 mm size. Here's a detailed look at the set of five. 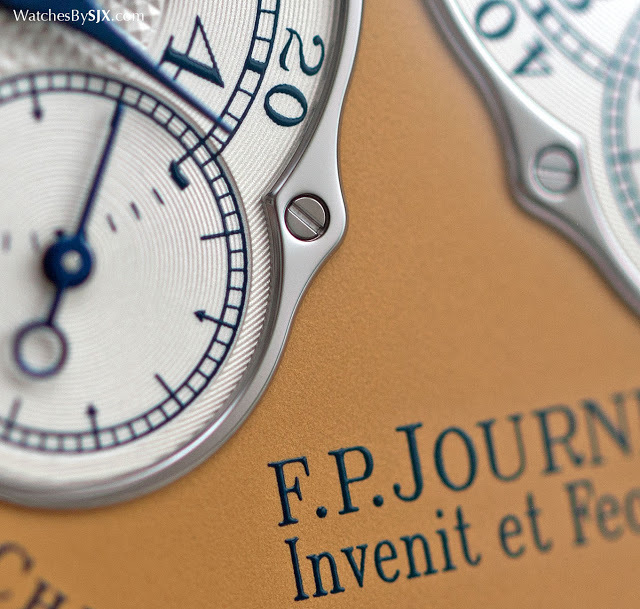 When François-Paul Journe unveiled his first wristwatch in 1999, it was a tourbillon in a 38 mm platinum case. Since then F.P. 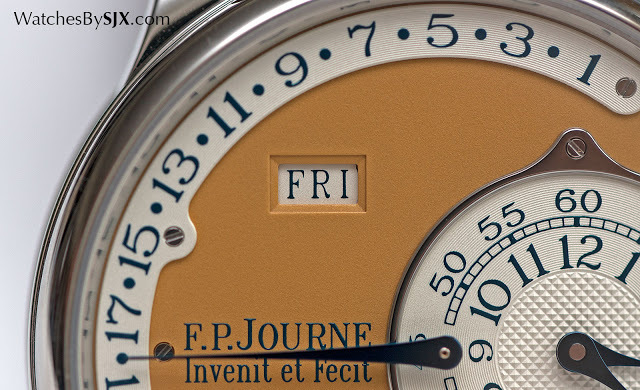 Journe has evolved, with its watchcases growing to 40 mm and now 42 mm. The original 38 mm size came to an end this year, with the final run of watches being the limited edition Steel 38 mm set in stainless steel, comprising of five of the brand’s signature timepieces – meriting its inclusion in our Christmas wish-list. Four of the watches in the Coffret 38 mm – Tourbillon Souverain, Chronometre a Resonance, Octa Calendrier, Octa Automatique – are in many ways the original F.P. Journe watches. Conceived with a sketch on a napkin in 1994, and introduced between 1999 and 2003, the quartet formed the foundations of the brand. All of them are now discontinued. 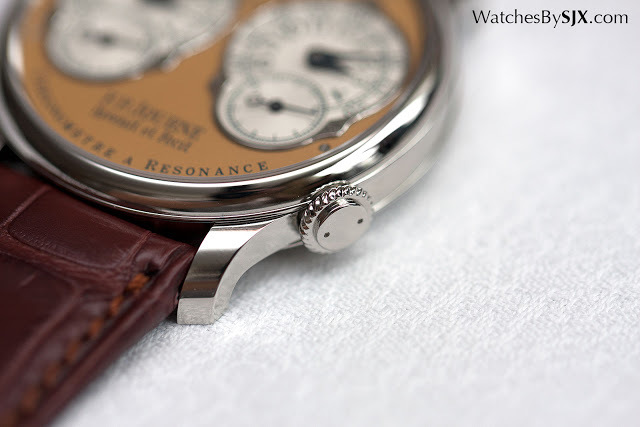 In the set they are joined by the Chronometre Souverain, which make its debut in 2005 and is still available. The simplest watch made by the brand, it’s one of the bestselling F.P. 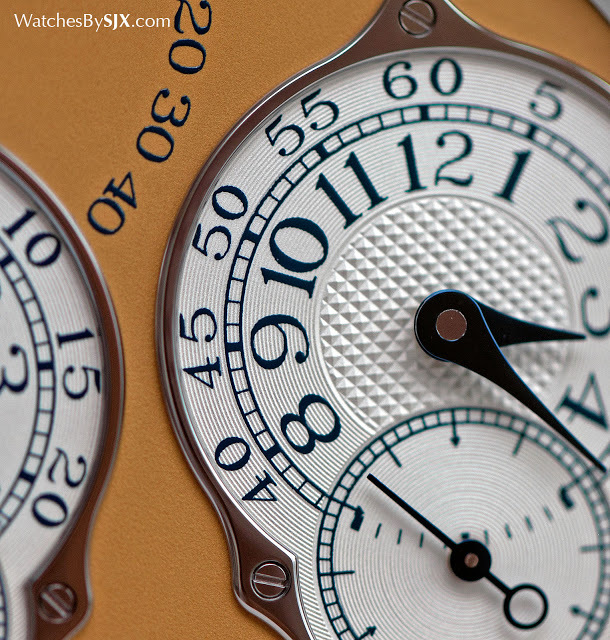 Journe watches (especially in the entry-level Chronometre Bleu variant) and makes up the fifth watch in the set. The quintessential F.P. Journe look originates with his original prototypes, which had platinum cases and the sub-dial of the tourbillon screwed onto the base plate of the gilded movement. 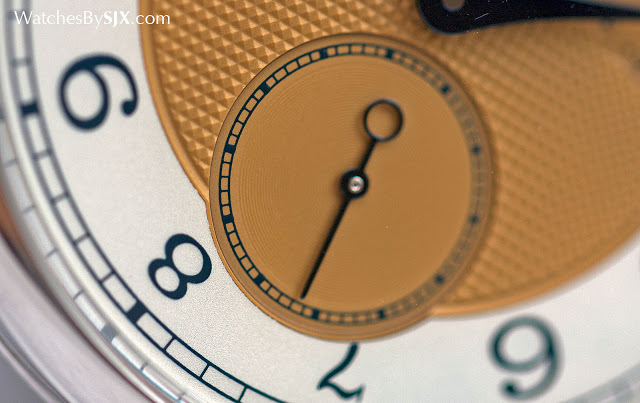 That later evolved into the golden dials that collectors find alluring. The steel set replicates that original look, but with subtle differences. 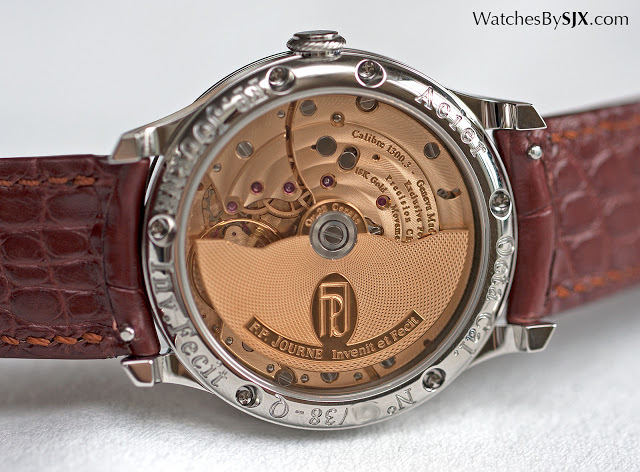 Instead of platinum the case is stainless steel, a material rarely used by F.P. Journe. In fact it’s only used for the minute repeater and grand sonnerie wristwatches for its acoustic quality; precious metals, being denser, transmit sound poorly. 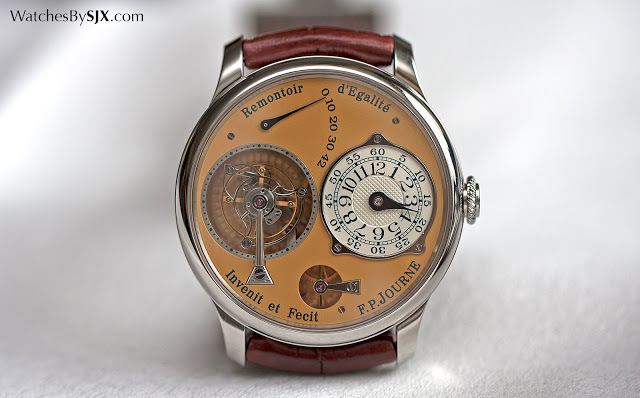 Though the case material is inexpensive, the dials and movements are all solid gold. Rose gold movements are standard for all current F.P. Journe watches. 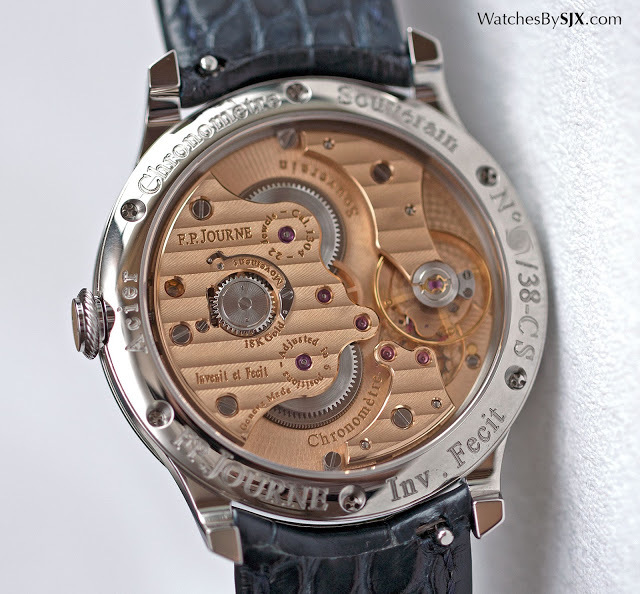 All the movements in the set are standard, except for the tourbillon – more on that below. 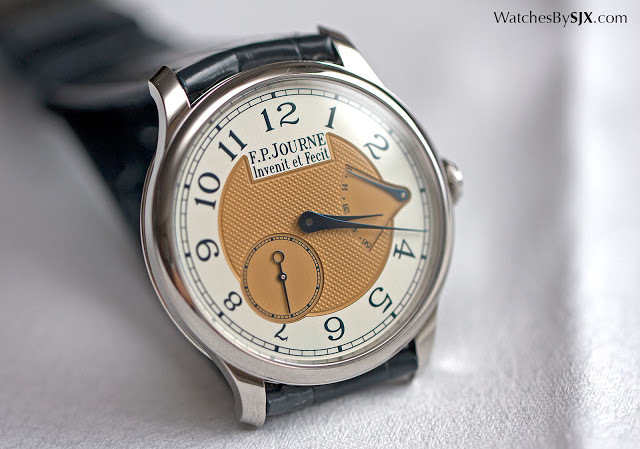 Though similar to the early Journe watches, the colour and texture of the dial is recognisably different. 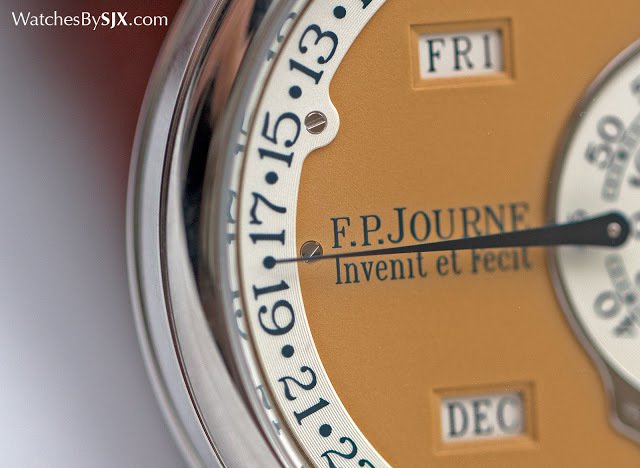 The dial is finished with what Journe terms a “bronze patina”, a smooth yellow, slightly mustard, colour. And unlike ordinary Journe watches which have black numbers and markings on a silvered dial, the watches of the set substitute black with a dark blue that matches the colour of the blued steel hands. 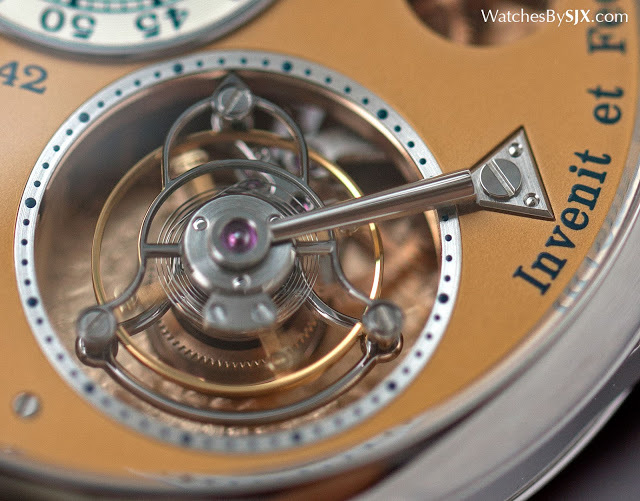 While the other watches in the set contain movements that are identical to those in the regular production models, the movement in the tourbillon is unique. Current production F.P. 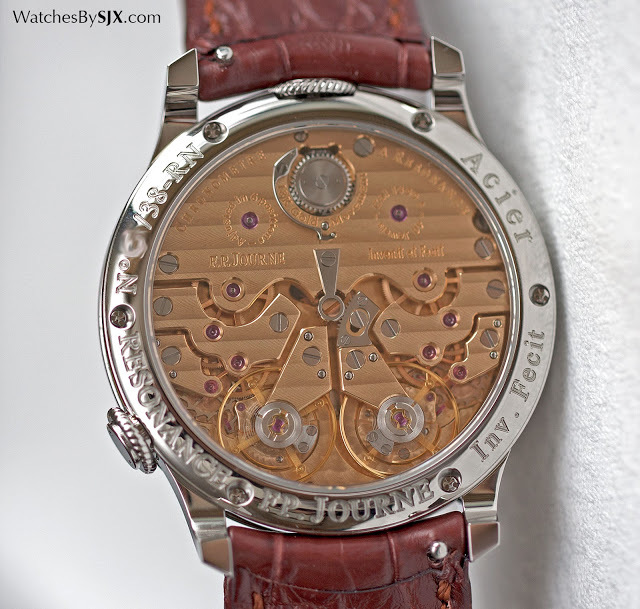 Journe tourbillons have a rose gold movements and a deadbeat seconds. Early F.P. 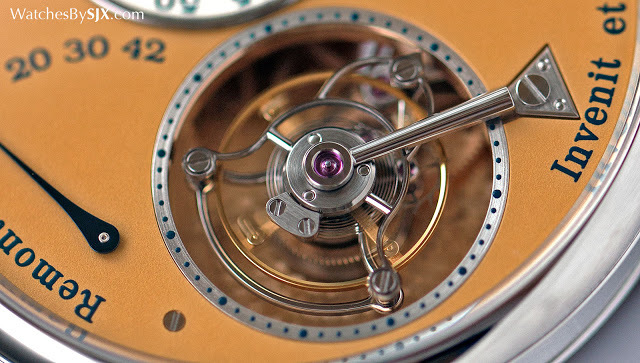 Journe tourbillons, on the other hand, have more conventional rhodium-plated brass movements with the blade spring of the constant force mechanism (the remontoir) exposed. 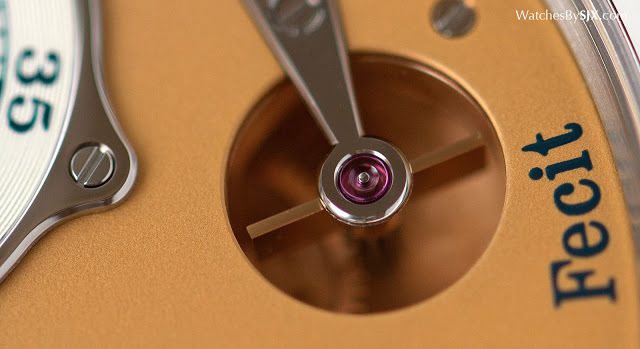 The movement inside the stainless steel tourbillon is a combination of both: it has the base plate and bridges in rose gold, but mechanically it is identical to the first generation, brass tourbillon movement. Only the steel tourbillon will ever have this movement. Despite looking similar to the early Journe tourbillons, the steel tourbillon features all the improvements found on current Journe watches, displaying a more refined level of movement finishing. F.P. 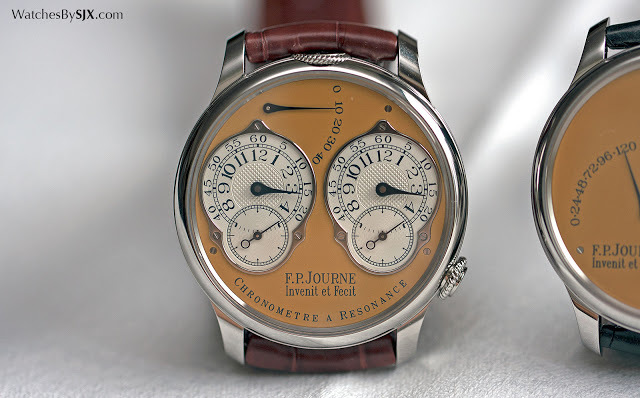 Journe has two wristwatches that are emblematic of the brand: the Tourbillon Remontoir and the Resonance. Of the two, the Resonance is arguably more unique. It operates on the principle of resonance, with twin balance wheels that beat in sync. In fact, the Resonance has essentially two movements inside the case, along with two independent time displays, powered by a single barrel. The steel Resonance is in the original guise of the model as envisioned by Journe in 1994 with a pair of symmetrically positioned sub-dials, along with an off-centre power reserve display at 12 o’clock. This contrasts with the current Resonance which has two differently styled sub-dials. Though the look is like that of the early Resonance, the movement is identical to that in the current model. F.P. Journe’s first self-winding timepiece was the Octa Automatique (a watch that was later known as the Octa Reserve de Marche). It’s a simple but decidedly practical watch, with a large date display and power reserve indicator. Most of the dial on the Octa Automatique is empty, though the design is still attractively purposeful. Putting the space on the dial to good use is the Octa Calendrier, which is equipped with a more elaborate version of the same movement. 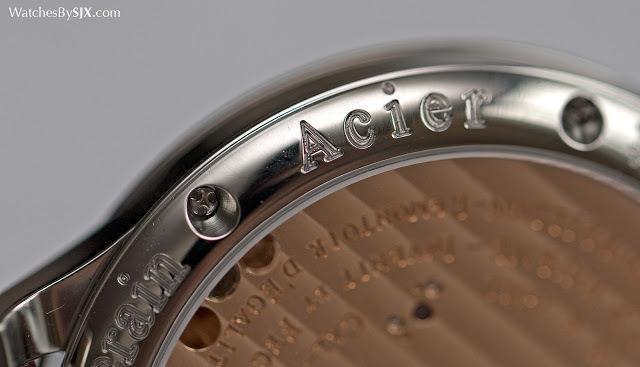 The Octa Calendrier has the addition of an annual calendar mechanism. Requiring adjustment once a year in February – the movement automatically accounts for 30 and 31 day months – the Calendrier has a long arc across the left of the dial for the date, a distinctive characteristic that has been dispensed with in the latest F.P. 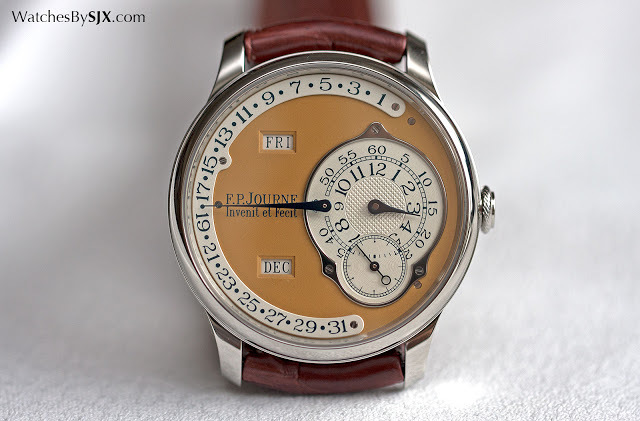 Journe perpetual calendar. A simple watch with only the time and a power reserve display, the Chronomètre Souverain is the most unusual looking watch of the set. Though it shares the same colour scheme as the rest, the Chronomètre Souverain is obviously designed according to different principles. But it is still visually pleasing, with the silvered chapter ring of the dial framing its gold centre. Because the Chronomètre Souverain has the largest hands of any watch in the set, the dark blue of the dial is more prominent here than on any of the others, making the colour of numerals more prominent. Despite being simple the Chronomètre Souverain includes some clever details, including the shrunken “7” and “8” on the dial. 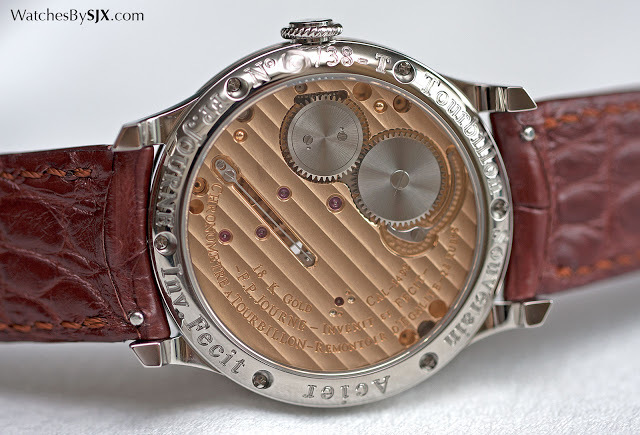 Neither is immediately apparent, but it ensures that the seconds sub-dial does not cut into any of the numerals. The movement is nearly symmetrical, with the gear train hidden in the main plate, revealing only the two barrels, the balance and escapement. The set is priced at SFr268,000 or just over US$300,000. It’s available from F.P. 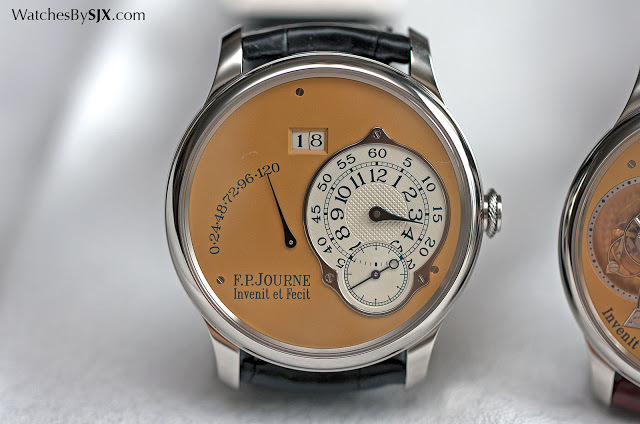 Journe boutiques and authorised dealers, but only to clients vetted by F.P. Journe himself. A potential buyer needs to fill up a slightly intrusive questionnaire detailing his watch collection and personal details.